I have been wanting to try some version of this recipe for quite some time but I couldn’t imagine it would be very flavorful. Then I happened to see a version (not vegan) by Chef Geoffrey Zakarian and decided to play around with it a bit. This Chickpea Salad exceeded any expectations I had for it and you’ll see below, we even enjoyed it in a spinach wrap. 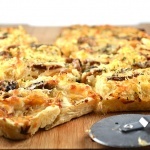 Some of the flavors I used are traditional such as celery, parsley and lemon juice. I added toasted walnuts and capers. In retrospect, I might have added some chopped Kalamata olives for even more flavor. 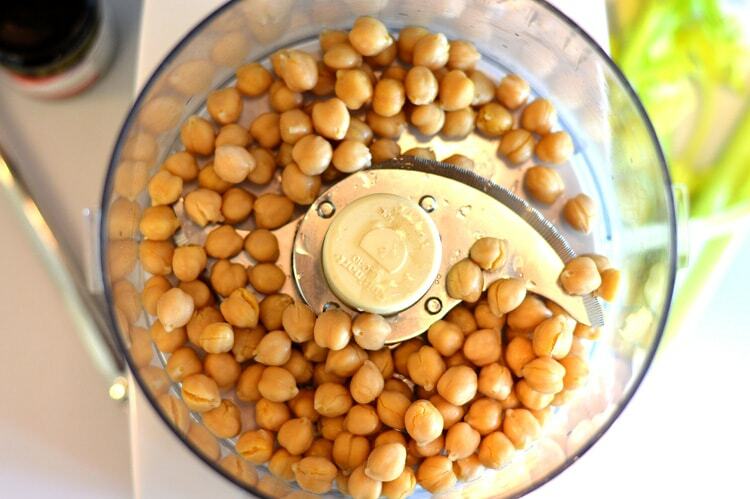 The first thing you’ll need to do is drain and rinse a can of chickpeas (garbanzo beans). I give them a brief pulse or two in the food processor. I try not to over process as I really want some texture here. I previously chopped the walnuts, parsley and celery again, to avoid over processing. They, along with the remaining ingredients: capers, salt, freshly cracked black pepper and a squeeze of fresh lemon juice get a quick pulse or two. A small amount of olive oil brings everything together. I folded in a very small amount of vegan mayonnaise to make this salad. I like the Just Mayo brand, but there are several really good ones on the market such as Vegenaise by Follow Your Heart and Nayonaise by Nasonya. You could use a homemade vegan mayonnaise. For a few homemade ideas, I found this page and I’m definitely going to try the silken tofu recipe. 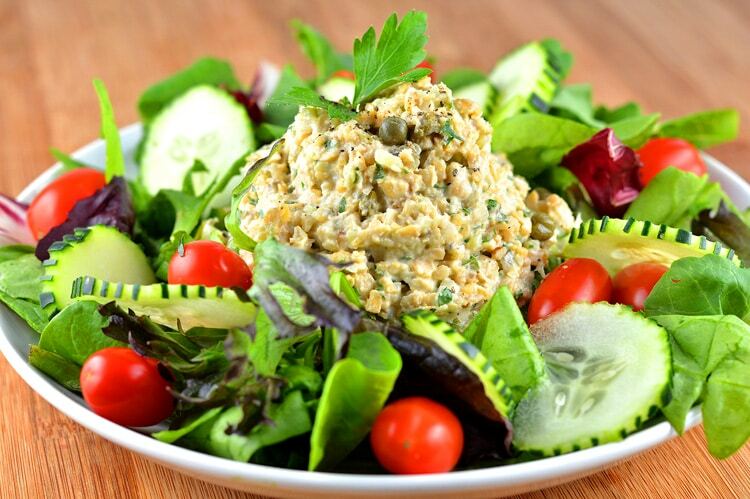 Serve with a salad of mixed greens, tomatoes and cucumbers. Those fancy little stripes were made with a citrus zester on the cucumber just before slicing. 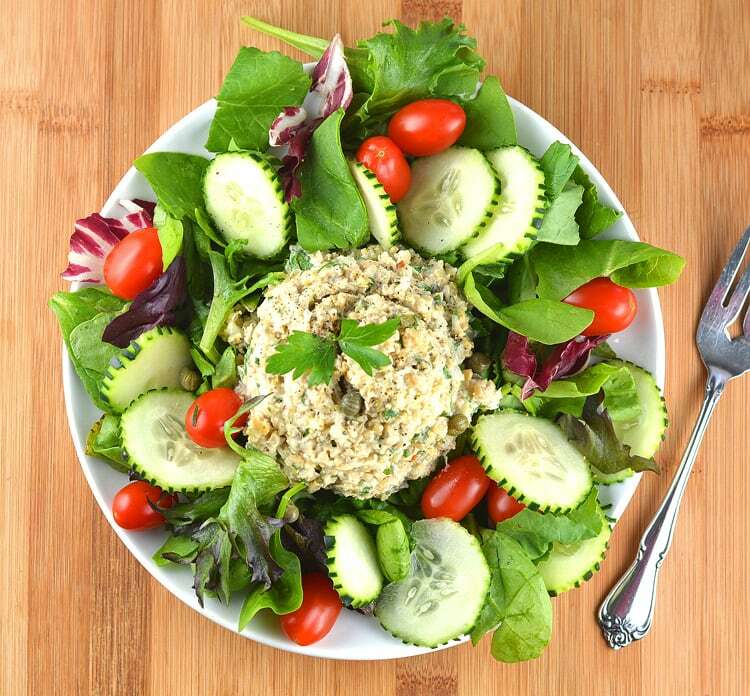 I think it adds a nice touch, especially if you’ll be serving this salad to guests. I had leftovers, so I decided to prepare a spinach wrap using the ingredients from the salad above. I did have to add more vegan mayo to the wrap. It would have been too dry. I also added two slices of vegan cheese. It was really yummy! 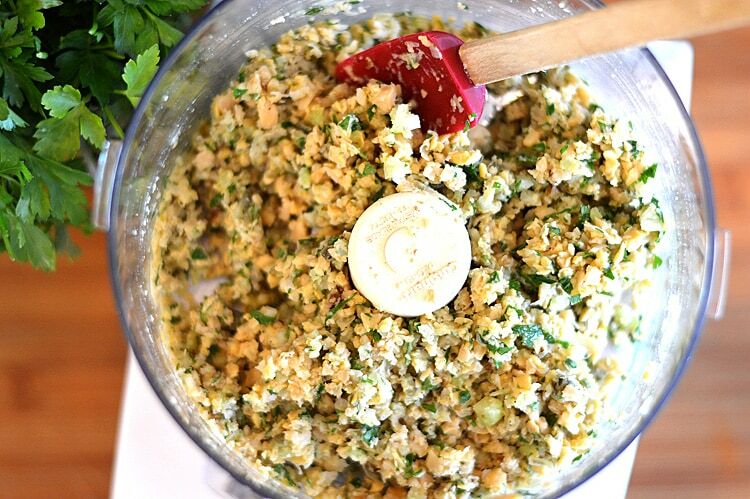 Chop the walnuts, celery and parsley. Add to the food processor. Drain the capers and add to the processor along with olive oil, lemon juice, salt and pepper. Finally, add the vegan mayonnaise, give it a few pulses and taste for seasoning. Serve on a bed of mixed greens or as we did, in a spinach wrap.